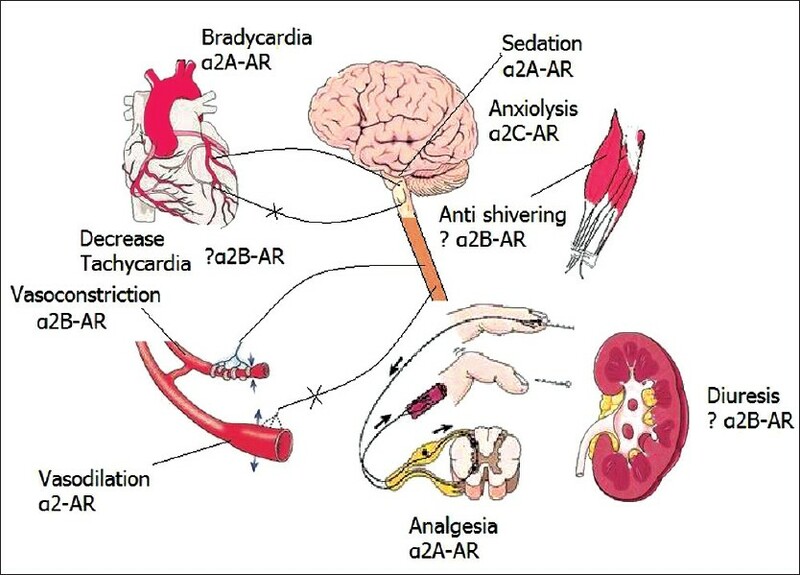 α 2-adrenergic receptor (α 2-AR) agonists have been successfully used in several clinical settings in view of diverse actions which include sedation, analgesia, anxiolysis, perioperative sympatholysis, cardiovascular stabilizing effects, reduced anesthetic requirements, and preservation of respiratory function. Dexmedetomidine is a relatively new drug approved at the end of 1999 by the Food and Drug Administration (FDA) for humans use for short-term sedation and analgesia (<24 hours) in the intensive care unit (ICU). Dexmedetomidine is a useful sedative agent with analgesic properties, hemodynamic stability and ability to recover respiratory function in mechanically ventilated patients facilitating early weaning. Besides being a new modality of sedation and analgesia in ICU patient management,  it has been studied in several other perioperative settings, which will be discussed. Dexmedetomidine is the dextrorotatory S-enantiomer of medetomidine, an agent used in veterinary medicine. It is chemically (S)-4-[1-(2,3-dimethylphenyl) ethyl]-3H-imidazole [Figure 1]. α 2-AR agonists produce clinical effects after binding to G-Protein-coupled α 2-AR, of which there are three subtypes (α 2A, α 2B, and α 2C) with each having different physiological functions and pharmacological activities. These receptor subtypes are found ubiquitously in the central, peripheral, and autonomic nervous systems, as well as in vital organs and blood vessels. Dexmedetomidine is 8 to 10 times more selective towards α 2-AR than clonidine. Neither clonidine nor dexmedetomidine is totally selective for any one of the α 2-AR subtypes, but dexmedetomidine seems to have higher α2A-AR and α 2C-AR affinity than clonidine. 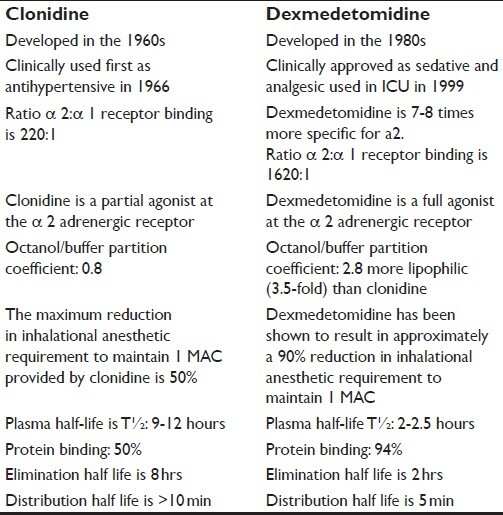 Major differences in the pharmacology of clonidine and dexmedetomidine have been described in [Table 1]. Locus ceruleus of the brain stem is the principal site for the sedative action and spinal cord is the principal site for the analgesic action, both acting through α 2A-AR. In the heart, the dominant action of α 2-AR agonists is a decrease in tachycardia (through blocking cardioaccelerator nerve) and bradycardia via α 2A-AR (through a vagomimetic action). In the peripheral vasculature, there is sympatholysis-mediated vasodilatation and smooth muscle cells receptor-mediated vasoconstriction. The mechanism for the antishivering and diuretic actions has yet to be established firmly  [Figure 2]. The responses to activation of the receptors in other areas include decreased salivation, decreased secretion, and decreased bowel motility in the gastrointestinal tract; contraction of vascular and other smooth muscle; inhibition of renin release, increased glomerular filtration, and increased secretion of sodium and water in the kidney; decreased intraocular pressure; and decreased insulin release from the pancreas. Combining all these effects, dexmedetomidine avoids some of the side effects of multiagent therapies. Dexmedetomidine undergoes almost complete biotransformation through direct N-glucuronidation and cytochrome P-450 (CYP 2A6)-mediated aliphatic hydroxylation to inactive metabolites. Metabolites are excreted in the urine (about 95%) and in the feces (4%). Dose adjustments are required in patients with hepatic failure because of lower rate of metabolism. Dexmedetomidine evokes a biphasic blood pressure response: A short hypertensive phase and subsequent hypotension. The two phases are considered to be mediated by two different α 2-AR subtypes: the α -2B AR is responsible for the initial hypertensive phase, whereas hypotension is mediated by the α 2A-AR. In younger patients with high levels of vagal tone, bradycardia and sinus arrest have been described which were effectively treated with anticholinergic agents (atropine, glycopyrrolate). Dexmedetomidine reduces cerebral blood flow and cerebral metabolic requirement of oxygen but its effect on intracranial pressure (ICP) is not yet clear. Dexmedetomidine modulates spatial working memory, enhancing cognitive performance besides having sedative, analgesic, and anxiolytic action through the α 2-AR. Studies suggest the likelihood of its neuroprotective action by reducing the levels of circulating and brain catecholamines and thus balancing the ratio between cerebral oxygen supplies, reducing excitotoxicity, and improving the perfusion in the ischemic penumbra. It reduces the levels of the glutamate responsible for cellular brain injury, especially in subarachnoid hemorrhage. It has been shown to limit the morphologic and functional effects after ischemic (focal and global) and traumatic injury to the nervous system. The various reported side effects are hypotension, hypertension, nausea, vomiting, dry mouth, bradycardia, atrial fibrillation, pyrexia, chills, pleural effusion, atelectasis, pulmonary edema, hyperglycemia, hypocalcaemia, acidosis, etc. Rapid administration of dexmedetomidine infusion (Loading dose of 1 μ/ kg/ hr if given in less than 10 minutes) may cause transient hypertension mediated by peripheral α 2B- AR vasoconstriction. But hypotension and bradycardia may occur with ongoing therapy mediated by central α 2A-AR, causing decreased release of noradrenaline from the sympathetic nervous system. Long-term use of dexmedetomidine leads to super sensitization and upregulation of receptors; so, with abrupt discontinuation, a withdrawal syndrome of nervousness, agitation, headaches, and hypertensive crisis can occur. Dexmedetomidine is not recommended in patients with advanced heart block and ventricular dysfunction. FDA has classified it as a category C pregnancy risk, so the drug should be used with extreme caution in women who are pregnant. Dexmedetomidine is used as an adjuvant for premedication, especially in patients susceptible to preoperative and perioperative stress because of its sedative, anxiolytic, analgesic, sympatholytic, and stable hemodynamic profile. Dexmedetomidine decreases oxygen consumption in intraoperative period (up to 8%) and in postoperative period (up to 17%). Premedication dose is 0.33 to 0.67 mg/kg IV given 15 minutes before surgery (this dose minimizes side effects of hypotension and bradycardia). Dexmedetomidine attenuates hemodynamic stress response to intubation and extubation by sympatholysis. ,,, In view of absent respiratory depression, it can be continued at extubation period unlike other drugs. Dexmedetomidine potentiates anesthetic effect of all the anesthetic agents irrespective of the mode of administration (intravenous, inhalation, regional block). Intraoperative administration of dexmedetomidine in lower concentrations has reduced the requirement of other anesthetic agents; fewer interventions to treat tachycardia; and a reduction in the incidence of myocardial ischemia. However, side effects like bradycardia and hypotension are limitations to its use necessitating need for pharmacological rescue therapy. These effects may be attributed to the combined properties of volatile anesthetics such as vasodilatation and myocardial depression. Dexmedetomidine administered in high concentrations may cause systemic and pulmonary hypertension because of direct peripheral vascular effects or may compromise myocardial function and blood pressure. Dexmedetomidine is an attractive agent for short-term procedural sedation and has been safely used in transesophageal echocardiography,  colonoscopy,  awake carotid endarterectomy,  shockwave lithotripsy,  vitreoretinal surgery,  elective awake fiberoptic intubation,  pediatric patients undergoing tonsillectomy,  and pediatric MRI. The usual dose of dexmedetomidine for procedural sedation is 1 μg/ kg, followed by an infusion of 0.2 μg/kg/h. Its onset of action is less than 5 minutes and the peak effect occur within 15 minutes. As the pharmacologic effects of dexmedetomidine can be reversed by the α 2-AR antagonist atipamezole,  dexmedetomidine provides a titratable form of hypnotic sedation that can be readily reversed. Dexmedetomidine is an effective and safe agent for controlled hypotension mediated by its central and peripheral sympatholytic action. Its easy administration, predictability with anesthetic agents, and lack of toxic side effect while maintaining adequate perfusion of the vital organs makes it a near-ideal hypotensive agent. Spinal fusion surgery for idiopathic scoliosis,  septoplasty and tympanoplasty operations,  and maxillofacial surgery  have been safely done with dexmedetomidine-controlled hypotension. Dexmedetomidine has been successfully used as an adjunct to unsatisfactory analgesia by systemic opioids in laboring parturients who could not benefit from epidural analgesia. It provides maternal hemodynamic stability, anxiolysis, and stimulation of uterine contractions. It is retained in placental tissue and passes less readily into the fetal circulation than clonidine because of high lipophilicity and thereby has less susceptibility to cause fetal bradycardia. Dexmedetomidine has been used successfully in the treatment of withdrawal from benzodiazepines, opioids, alcohol, and recreational drugs. As an adjunct in otorhinolaryngology anesthesia for middle ear surgery and rhinoplasty. As an adjunct in the repair of aortic aneurysms. Management of tetanus in ICU. Dexmedetomidine is effective in preventing ethanol-induced neurodegeneration. Dexmedetomidine because of its unique properties offers its promising use in wide spectrum of clinical settings and ICUs. It is a part of fast-tracking anesthesia regimens and offers anesthetic sparing and hemodynamic stabilizing effects. As pharmacological effects of dexmedetomidine can be reversed by α 2-AR antagonist atipamezole, combination of dexmedetomidine and atipamezole can provide titratable form of sedation in the future. 1. Kemp KM, Henderlight L, Neville M. Precedex: Is it the future of cooperative sedation? Nursing 2008;38 Suppl Critical:7-8. 2. Takrouri MS, Seraj MA, Channa AB, el-Dawlatly AA, Thallage A, Riad W, et al. Dexmedetomidine in intensive care unit: A study of hemodynamic changes. Middle East J Anesthesiol 2002;16:587-95. 3. Takrouri MS. New concepts in intensive care: Dexmedetomidine and immunonutrition. Middle East J Anesthesiol 2002;16:567-72. 4. Dexmedetomidine. 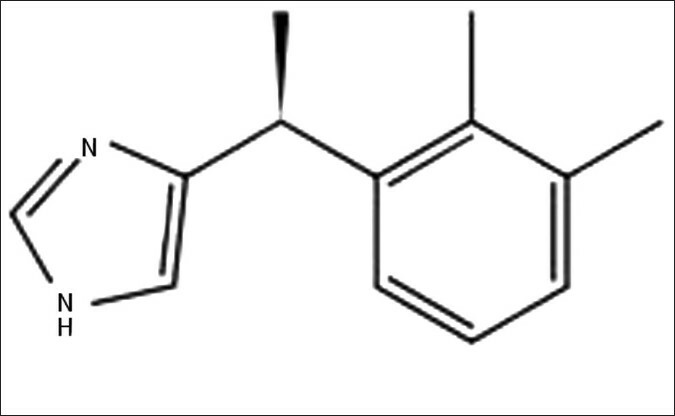 Available from: http://en.wikipedia.org/wiki/Dexmedetomidine [Last accessed on 2011 March 18]. 5. Afsani N. Clinical application of dexmedetomidine. S Afr J Anaesthesiol Analg 2010;16:50-6. 6. Wagner DS, Brummett CM. Dexmedetomidine: As safe as safe can be. Semin Anesth Perioper Med Pain 2006;25:77-83. 7. Fairbanks CA, Stone LS, Wilcox GL. Pharmacological profiles of alpha 2 adrenergic receptor agonists identified using genetically altered mice and isobolographic analysis. Pharmacol Ther 2009;123:224-38. 8. Macdonald E, Koblka BK, Scheinin M. Gene targeting-homing in on alpha 2-adrenoceptor-subtype function. Trends Pharmacol Sci 1997;18:211-9. 9. Kamibayashi T, Maze M. Clinical Uses of a2-Adrenergic Agonists. Anesthesiology 2000;93:1345-9. 10. Gertler R, Brown HC, Mitchell DH, Silvius EN. Dexmedetomidine: A novel sedative-analgesic agent. Proc (Bayl Univ Med Cent) 2001;14:13-21. 11. Anttila M, Penttilä J, Helminen A, Vuorilehto L, Scheinin H. Bioavailability of dexmedetomidine after extravascular doses in healthy subjects. Br J Clin Pharmacol 2003;56:691-3. 12. Philipp M, Brede M, Hein L. Physiological significance of alpha(2)-adrenergic receptor subtype diversity: One receptor is not enough. Am J Physiol Regul Integr Comp Physiol 2002;283: R287-95. 13. Franowicz JS, Arnsten AF. The alpha-2a noradrenergic agonist, guanfacine, improves delayed response performance in young adult rhesus monkeys. Psychopharmacology (Berl) 1998;136:8-14. 14. Bekker A, Sturaitis MK. Dexmedetomidine for neurological surgery. Neurosurgery 2005;57:1-10. 15. Venn RM, Hell J, Grounds RM. Respiratory effects of dexmedetomidine in the surgical patient requiring intensive care. Crit Care 2000;4:302-8. 16. Hsu YW, Cortinez LI, Robertson KM, Keifer JC, Sum-Ping ST, Moretti EW, et al. Dexmedetomidine pharmacodynamics: Part I: Cross-over comparison of the respiratory effects of dexmedetomidine and remifentanil in healthy volunteers. Anesthesiology 2004;101:1066-76. 17. Siobal MS, Kallet RH, Kivett VA, Tang JF. Use of dexmedetomidine to facilitate extubation in surgical intensive-care-unit patients who failed previous weaning attempts following prolonged mechanical ventilation: A pilot study. Respir Care 2006;51:492-6. 18. Ebert TJ, Hall JE, Barney JA, Uhrich TD, Colinco MD. The effects of increasing plasma concentrations of dexmedetomidine in humans. Anesthesiology 2000;93:382-94. 19. Venn R, Bryant A, Hall GM, Grounds RM. Effects of dexmedetomidine on adrenocortical function and the cardiovascular, endocrine and inflammatory responses in post-operative patients needing sedation in the intensive care unit. Br J Anaesth 2001;86:650-6. 20. Morgan GE, Mikhail MS, Murray MJ. Preoperative Medication in Clinical Anaethesia. In: Morgan GE, Mikhail MS, Murray MJ, Editors. 4 th ed. New York: Mc graw Hill; 2006. p. 248. 21. Taittonen MT, Kirvela OA, Aantaa R, Kanto JH. Effect of clonidine and dexmedetomidine premedication on perioperative oxygen consumption and haemodynamic state. Br J Anaesth 1997;78:400-6. 22. Scheinin B, Lindgren L, Randell T, Scheinin H, Scheinin M. Dexmedetomidine attenuates sympathoadrenal responses to tracheal intubation and reduces the need for thiopentone and peroperative fentanyl. Br J Anaesth 1992;68:126-31. 23. Aho M, Lehtinen AM, Erkola O, Kallio A, Korttila K. The effect of intravenously administered dexmedetomidine on perioperative hemodynamics and isoflurane requirements in patients undergoing abdominal hysterectomy. Anesthesiology 1991;74:997-1002. 24. Guler G, Akin A, Tosun E, Eskitafloglu E, Mizrak A, Boyaci A. Single-dose dexmedetomidine attenuates airway and circulatory reflexes during extubation. Acta Anaesthesiol Scand 2005;49:1088-91. 25. Schnaider TB, Vieira AM, Brandao AC, Lobo MV. Intraoperative analgesic effect of epidural ketamine, clonidine or dexmedetomidine for upper abdominal surgery. Rev Bras Anestesiol 2005;55:525-31. 26. El-Hennawy AM, Abd-Elwahab AM, Abd-Elmaksoud AM, El-Ozairy HS, Boulis SR. Addition of clonidine or dexmedetomidine to bupivacaine prolongs caudal analgesia in children. Br J Anaesth 2009;103:268-74. 27. Kanazi GE, Aouad MT, Jabbour-Khoury SI, Al Jazzar MD, Alameddine MM, Al-Yaman R, et al. Effect of low-dose dexmedetomidine or clonidine on the characteristics of bupivacaine spinal block. Acta Anaesthesiol Scand 2006;50:222-7. 28. Yoshitomi T, Kohjitani A, Maeda S, Higuchi H, Shimada M, Miyawaki T. Dexmedetomidine enhances the local anesthetic action of lidocaine via an alpha-2A adrenoceptor. Anesth Analg 2008;107:96-101. 29. Memiº D, Turan A, Karamanlıog¢lu B, Pamukçu Z, Kurt I. Adding Dexmedetomidine to Lidocaine for Intravenous Regional Anesthesia. Anesth Analg 2004;98:835-40. 30. Esmaoglu A, Yegenoglu F, Akin A, Turk CY. Dexmedetomidine added to levobupivacaine prolongs axillary brachial plexus block. Anesth Analg 2010;111:1548-51. 31. Al-Metwalli RR, Mowafi HA, Ismail SA, Siddiqui AK, Al-Ghamdi AM, Shafi MA, et al. Effect of intra-articular dexmedetomidine on postoperative analgesia after arthroscopic knee surgery. Br J Anaesth 2008;101:395-9. 32. Paul S, Bhattacharjee DP, Ghosh S, Dawn S, Chatterjee N. Efficacy of intra-articular dexmedetomidine for postoperative analgesia in arthroscopic knee surgery. Ceylon Med J 2010;55:111-5. 33. Short J. Use of Dexmedetomidine for Primary Sedation in a General Intensive Care Unit. Crit Care Nurse 2010;30:29-38. 34. Kaygusuz K, Gokce G, Gursoy S, Ayan S, Mimaroglu C, Gultekin Y. A comparison of sedation with dexmedetomidine or propofol during shockwave lithotripsy: A randomized controlled trial. Anesth Analg 2008;106:114-9. 35. Shehabi Y, Botha JA, Ernest D, Freebairn RC, Reade M, Roberts BL, et al. Clinical application, the use of dexmedetomidine in intensive care sedation. Crit Care Shock 2010;13:40-50. 36. Pandharipande PP, Pun BT, Herr DL, Maze M, Girard TD, Miller RR, et al. Effect of sedation with dexmedetomidine vs lorazepam on acute brain dysfunction in mechanically ventilated patients: The MENDS randomized controlled trial. JAMA 2007;298:2644-53. 37. Cooper L, Candiotti K, Gallagher C, Grenier E, Arheart KL, Barron ME. A Randomized, Controlled Trial on Dexmedetomidine for Providing Adequate Sedation and Hemodynamic Control for Awake, Diagnostic Transesophageal Echocardiography. J Cardiothorac Vasc Anesth 2011;25:233-7. 38. Jalowiecki P, Rudner R, Gonciarz M, Kawecki P, Petelenz M, Dziurdzik P. Sole use of dexmedetomidine has limited utility for conscious sedation during outpatient colonoscopy. Anesthesiology 2005;103:269-73. 39. Bekker AY, Basile J, Gold M, Riles T, Adelman M, Cuff G, et al. Dexmedetomidine for awake carotid endarterectomy: Efficacy, hemodynamic profile, and side effects. J Neurosurg Anesthesiol 2004;16:126-35. 40. Ghali A, Mahfouz AK, Ihanamäki T, El Btarny AM. Dexmedetomidine versus propofol for sedation in patients undergoing vitreoretinal surgery under sub-Tenon's anesthesia. Saudi J Anaesth 2011;5:36-41. 41. Bergese SD, Khabiri B, Roberts WD, Howie MB, McSweeney TD, Gerhardt MA, et al. Dexmedetomidine for conscious sedation in difficult awake fiberoptic intubation cases. J Clin Anesth 2007;19:141-4. 42. Olutoye OA, Glover CD, Diefenderfer JW, McGilberry M, Wyatt MM, Larrier DR, et al. The effect of intraoperative dexmedetomidine on postoperative analgesia and sedation in pediatric patients undergoing tonsillectomy and adenoidectomy. Anesth Analg 2010;111:490-5. 43. Phan H, Nahata MC. Clinical uses of dexmedetomidine in pediatric patients. Paediatr Drugs 2008;10:49-69. 44. Aho M, Erkola O, Kallio A, Scheinin H, Korttila K. Comparison of dexmedetomidine and midazolam sedation and antagonism of dexmedetomidine with atipamezole. J Clin Anesth 1993;5:194-203. 45. El-Gohary MM, Arafa AS. Dexmedetomidine as a hypotensive agent: Efficacy and hemodynamic response during spinal surgery for idiopathic scoliosis in adolescents. Egyp J Anaesth 2010;26:305-11. 46. Ayoglu H, Yapakci O, Ugur MB, Uzun L, Altunkaya H, Ozer Y, et al. Effectiveness of dexmedetomidine in reducing bleeding during septoplasty and tympanoplasty operations. J Clin Anesth 2008;20:437-41. 47. Richa F, Yazigi A, El Hage C, Jebara S, Hokayem N, Antakly MC. Dexmedetomidine: An agent for controlled hypotension in maxilla-facial surgery. Eur J Anaesthesiol 2004;21:902-6. 48. Wijeysundera DN, Naik JS, Beattie WS. Alpha-2 adrenergic agonists to prevent perioperative cardiovascular complications: A meta analysis. Am J Med 2003;114:742-52. 49. Hofer RE, Sprung J, Sarr MG, Wedel DJ. Anesthesia for a patient with morbid obesity using dexmedetomidine without narcotics. Can J Anesth 2005;52:176-80. 50. Abu-Halaweh SA, Al Oweidi AK, Abu-Malooh H, Zabalawi M, Alkazaleh F, Abu-Ali H, et al. Intravenous dexmedetomidine infusion for labour analgesia in patient with preeclampsia. Eur J Anaesthesiol 2009;26:86-7.